So here’s the first monitor and I think this one, is actually one of the best on the market for value for money and simplicity of use. It would make a great Christmas present for that special person. Useful as well as supporting their good health. Cons: Not very comfortable, noisy, lacks extra features. You need to check you have the right sized cuff when purchasing. 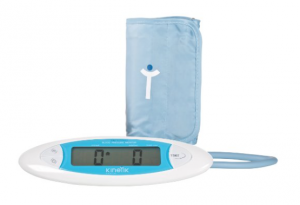 This is a very good value monitor at just £20.00 and it is very accurate. No bells and whistles but accuracy is its best attribute. The display is easy to read for those of us who are visually challenged. You probably won’t even have to put your glasses on to look at the result. It has a large start button and can store 60 readings in its memory. Despite being very accurate, it is not the most comfortable of monitors to use with a firm grip on your arm as it inflates. It also makes a pumping noise which is not ideal for keeping relaxed, something you need to be whilst taking your reading. Tip – always look at a blank wall whilst taking your reading, it does help. Remember before you buy it, to make sure the cuff supplied will fit you. According to the specification, the standard cuff size supplied is 22.0 – 30.0 cm. This is not that big so measure your mid to upper arm circumference and apply it to the product information. If the cuff is too big for you, the unit will give you a lower than accurate reading and if it is too small it will give a higher reading. You can find information on cuff sizing on their site. 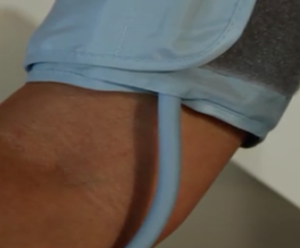 If you’re not too worried about the tightness of the cuff when it is inflating and you don’t want any extra features other than a 60 readings memory, it’s the ideal choice. 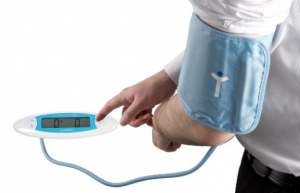 Accuracy is the most important feature of a blood pressure monitor. Reading time is not as fast as some but fair to middling at around 45 seconds. It comes with a storage case so is ideal for the traveller so you can use it at home as well as on the road. It’s very compact and light and will easily stow in the corner of an overnight case. This monitor has had over 300 reviews on Amazon UK alone and the majority of customers are really pleased with the unit. Many point out that the ‘Which’ magazine have given it top marks and it is their best buy. Despite being a basic monitor it has been given the top spot because of its accuracy, ease of use and clarity of display as well as being compact and lightweight and ideal for those getaways. Amazon reviewers give the monitor 4.6 out of 5 stars. I have dropped that a little, simply because of the need to check the cuff size before purchasing. It would appear many people didn’t realise this and have consequently bought the wrong size cuff which will give an inaccurate reading and was inconvenient for them. 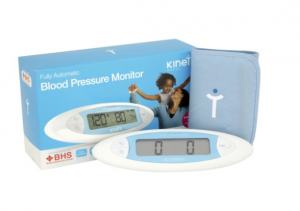 Buy this blood pressure monitor if…. Buy this monitor if you’re looking for exceptional value and simplicity of use. It is actually the best monitor for the price IMHO. It comes complete with one high quality standard size cuff 22-30 cm – make sure this is your size before buying.